Today I am doing what I should have done two years ago—putting a For Sale sign on our (really my) Piaggio Fly 150 scooter. I had talked for several years about getting a motor scooter and in the spring of 2009, without as much research as we should have done, we purchased one. We chose the model with more power so that we could ride it together. And therein lay the main problem. We needed motorcycle learner's permits to ride it, which we got and then renewed two years later. In order to ride with a passenger, the actual motorcycle license is necessary and we never made it to that point. I'm not sure what we were thinking about riding double. We go through life best side by side. Neither one of is particularly suited to the back seat. So the scooter became mine and I struggled with it. While it certainly is no motorcycle, it is a little too big and heavy for me. I had envisioned myself as Audrey Hepburn zipping around Rome in Roman Holiday but the experience was quite different. The times when I did get out on a country road were wonderful. Of course there was no wind blowing through my hair since I was wearing a helmet but it still felt grand. However, most of the time I rode it around town and in traffic which made me nervous. Because of its size, it needed to be driven on the road and not in the bike lane. I had the most difficulty with its weight in tight spaces. And as I rode it short distances—to the post office and the library but not the grocery store with the scary parking lot—I kept thinking how much more exercise I would be getting if I were on a bicycle. So I felt guilty when I didn't ride and guilty when I did. I knew it wasn't right for me that first year but I kept on. In addition to a deluded sense of hope that it could all be different the next summer, I felt that to let it go meant defeat. It had become an emblem of fear and failure. The second year I barely rode it and the third, I did enough to feel that giving it up would not be surrender. 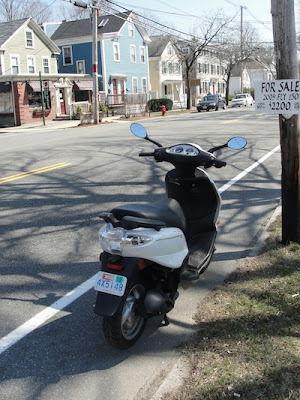 It is with a still conflicted heart that I put the sign on the scooter but I do know that when it is gone and I take part of the proceeds to purchase a human-powered bicycle, I will be smiling as I pedal down the street. I rode motorcycles back in the 80's, sold my favourite the silver Honda 250 dirt bike in 1990 to buy the NSK dentist drill with the micro motor in the hand piece that will last for the rest of my life. It carves and engraves on anything and everything from glass to jet, wood & cardboard, perspex, rubber, stainless steel, even titanium, it's a brilliant tool. I occasionally look longingly at the Deus Ex Machina "Grievous Angel"
but I just visit the Deus shop when I need to remember that I don't bounce as well as I used to and the hard thing about riding a motorcycle is I did fall off more than occasionally! It's only a ten minute ride away on my ancient early 70's second hand 3 speed Raleigh bicycle which is as you say much safer in the inner city traffic (Sydney has over 4 million people) and has the added bonus of keeping me fit! Have fun on your new bike! Thank for sharing Mo. Sounds like a good trade although the Grievous Angel is beautiful. But think of all the beautiful things you have been able to create with the drill. I'll let you know about the bike.